Short jacket. Black cotton garment is open at front with a collar of red and blue stripes. 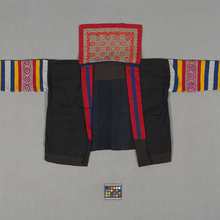 Sleeves are long and made in Hmong style with layered bands of red, yellow and blue applique, interspersed by panels of embroidery and patterned fabric. A collar flap hangs partially down the back, with embroidered tan squares and black circles on a red background.